Brave Texans, attempting to keep Mexicans from crossing a wall. Déjà vu, anyone? An old Spanish mission near San Antonio swelters in the swooning Texas heat, surrounded on all sides by over 2,000 Mexican troops under the command of the charismatic devil-spawn known as General Antonio López de Santa Anna. Inside the mission, 260 soldiers of the Republic of Texas know that there is no longer any hope of survival. Their defeat is imminent. Death stares at them, unblinking. But the brave soldiers hold their ground, steadfast in the face of an enemy that crushingly outnumbers them. They carry with them a fighting spirit that will later lead their fellow countrymen into brilliant victory at the Battle of San Jacinto. Though this battle will last only thirteen days, its legacy will resound through the months to come, rallying the Texan Revolutionaries to fight ever-stronger for their cherished ideals of justice, freedom of religion, freedom of expression,...and the right to beat an African slave within an inch of his goddamned life. This is not merely a siege where one side is surrounded, killed, torn apart, used as piñatas, and then thrown to the dogs — this...this...is the Battle of the Alamo. 3.2 They're Coming Outta the Goddamn Walls! A monument to a great battle, and, more importantly, a boon to the San Antonio Convention and Visitors Bureau. In the early 1800's, before Texas became a part of the United States of America — a gracious host for Texas and its ego — it was a territory of Mexico, then part of the Spanish Empire. The territory was named after the Native American word for friendship, Tejas, which was fitting, since Texans had to use friendship in working together while fighting Indian Raiding parties. During that time, there was a large influx of immigrants from United States and elsewhere, many seeking a new life on the wild frontier and to escape from hard times. Over time, there were more American immigrants than native Mexican residents (a shift of demographics from the present, as the opposite is true today). The immigrants brought with them their protestant beliefs, and their true American values of freedom, which they showed by bringing thousands of enslaved Africans with them. All was well in Texas, and the residents enjoyed years of semi-independence and individual rights, until Santa Anna came into power as President of the recently established Republic of Mexico. The gradual change to more dictatorial policies by the Mexican government reminded the immigrants of their bad experience with a certain other unnamed oppressive power that had ruled them before. Centralization of the government also played a part in instigating the conflict, but that don't make for good history, so we'll ignore that part. Santa Anna soon demonstrated that he was not just a massive killjoy — he was also a massive failure at History 101. Metaphorically shutting the gates of Mexican Texas to immigrants, he then made modest demands of the Americans who remained behind — requesting politely that they do such things as pay more taxes, speak only Spanish...and worship only in government-approved churches. Worst of all, he banned the selling and transfer of slaves in Texas — without their labor and skilled handiwork, how were Texians supposed to plant without soiling their finely pressed suits?! The naturally-peeved Texans, fearing for the fate of their property, and bristling under the injustices perpetrated upon them by the Mexican government, rose up in armed rebellion, demonstrating that you may occasionally mess with Texas — and you may even get away with it — but you definitely do not mess with a Texian's right to swap niggers. The Texas Revolution had begun. ...aaaaand then be annexed by the United States. Finding himself low on supplies, Colonel Bowie requested from the provisional government "more men, money, guns, bullet-lead, cannonballs, cannon powder, biscuits, beef, salt pork, laudanum, and, for the love of the good, Christian God, more liquor!" But the provisional governement refused, on a legendary principle of tight-fistedness which pervades Texas to the present day. Low on both ammunition and whores, the Texan soldiers fortified the old Mission (which, sadly, was a very good location for a mission, but a very poor location for a fort), while Santa Anna and his troops gathered outside, readying to strike the Texans and deprive them of their freedom — and their lives. Not even bolded words can describe the drama and tension that would surround the events of the Alamo. During the siege, the Texan soldiers would periodically shoot at the Mexican troops when there wasn't much else to do. 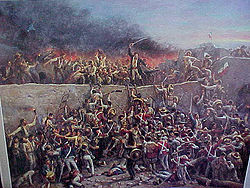 The Battle of the Alamo officially started on February 23rd, 1836, when Santa Anna and his troops marched into San Antonio, and surrounded the old Spanish fort. Unlike conventional battles in which the combatants shot each other until everyone was dead, the other side was already dying of dysentery. Earlier, the troops marched straight into the heartland of Texas, combating the cold winter, Comanche raiding parties, lack of supplies, and drunk Texan settlers fighting for their rights. Marching hundreds of miles took a toll on the Mexican troops, especially the lack of supplies, since it was difficult to combat the lack of something, instead of the presence of it. Eventually, Bexar was occupied by Mexican forces, and they raised a blood red flag, which meant no quarter. This made it hard to operate slot machines, which were popular with the Mexican troops at the time. As usual for overnight stays in Texas, the soldiers had shoddy accommodations. In the first days of the siege, it wasn't a very interesting affair. Other than looking out for the occasional skirmish, singing old folk songs by the campfire, contemplating the future, and slowly starving to death, there wasn't much to do. 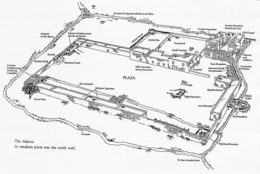 Sometimes, one side would fire a cannon shot or two, and then the other side would retaliate with more cannon shots, but other than that, the first days were an exercise in the mundane, but this was expected, since sieges involve waiting for the enemy to either starve or surrender. Many of the soldiers in the Alamo made it clear that they weren't going to surrender, so starvation was common. To break the tedium, there were some small skirmishes, but they weren't very interesting; other than a few torched huts and some lost lives, not much happened. One somewhat interesting thing some soldiers did was write letters. Some wrote to their parents about their impending deaths, some wrote to their friends about their impending death, and some wrote to their children about their impending death. Without the brave soldier's letters, the only way we would've known of the finer details of the Battle of the Alamo was through Susanna Dickinson, and as we all know, women are deceitful, manipulative creatures. Unfortunately, due to food poisoning from a rancid Piña colada, James Bowie became severely ill, and couldn't effectively command his troops. So he left command to the handsome William Travis, a good choice for future purchasers of Alamo commemorative plates and medallions. While the Alamo defenders continued to strengthen their defenses and slowly starve, the Mexican forces surrounding them continued adding more artillery batteries, which Santa Anna put to great use when he ordered all his troops to charge head on into the fortified Mission. 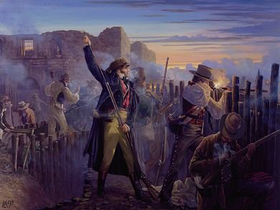 Although the troops garrisoned in the Alamo were badly in need of more weapons, food, equipment, and reinforcements, they were (mostly) on their own; the few potential bullet sponges that did try to reach the Alamo were stopped by the Mexican forces. Their was little hope of victory for the defenders, but, they didn't lose hope. Those freedom fighters were a shining example for us all, dying for a country that they believed in, and martyring themselves for something they thought greater, unlike the Muslim terrorists we fight today. One very ingenious Texan soldier (pictured here) used his rifle as a club, completely leaving his body open to rifle fire in what only seemed like an idiotic mistake. The date was March 5th, 1836, a day that would live on in the annals of time. Two-hundred sixty soldiers, vastly outnumbered, outgunned, and underequipped, stood tall against Santa Anna's forces. The day before, William Travis — knowing they had no chance to survive — gathered all his men, and drew a line in the sand, asking the men who would be willing to fight and die for Texas to cross the line, though this was useless, as they were in a siege and were unable to leave, but its the thought that counts. Knowing of their impending death, the Texan defenders still rose to the challenge, fighting insurmountable odds, and making history. Little did they know what would follow would become the most epic, bittersweet, endearing, and cinematic battle ever known to man. On 10:00 PM, the Mexican forces' artillery barrage finally stopped, creating a wary stillness in the air. Seeing this as an opportunity for some rest, the Texan defenders went to sleep, unaware of the coming assault. Unlike an honorable, chivalrous foe, Santa Anna, with all his cruel cunning, anticipated this, and prepared a full-frontal assault on the complex. The nighttime's anxious equilibrium was shattered by the sounds of musket fire, killing Three scouts stationed just outside the Alamo while they were asleep. The Mexican troops attempted to sneak up on the defenders, but the Texans were awoken by the shouts of "¡Viva Santa Anna!" and "¡Viva la tequilla!" from the more inebriated recruits. Quickly, the Texans awoke, and sprung into action, showing that not even the perils of sleep could dissuade a Texan soldier. Foiling the Mexican's dastardly sneak attack, the Alamo defenders shot at their enemies, killing many of them and temporarily preventing a breach of the wall. Unfortunately, due to the awful design flaws from the Mission's lazy Spanish architects, the Mexican troops were able to cross the wall's borders. This further cemented Mexicans' reputation of breaching border walls. 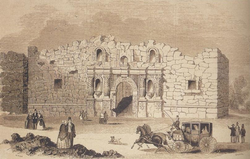 Santa Anna's soldiers breached the defenses of the Alamo, penetrating the walls of the impromptu fortress. The Texas defenders fighting bravely, fearless of the cold grasp of death, killed many of the invaders before dying. Intense fighting took place in the interior, and amidst the chaos, the spirit of the Texas revolutionaries shone through, before being spiked to death by bayonets. Very few of the Texans (only 50), who weren't very appreciative of what was going around them, attempted to escape, but they were quickly killed. Eventually, all the Texans died, but they were able to perform the difficult feat of inflicting over four-hundred casualties on the poorly-equipped, poorly-fed, and forcibly conscripted Mexican army. Seeking an easy battle, Santa Anna and his troops instead were shown that even in defeat, Texans could instill the fear of messing with Texas into people and litter. 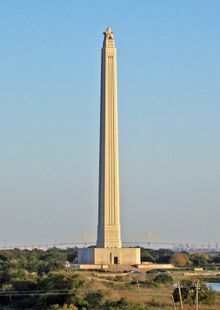 A monument to the Battle of San Jacinto, which, in the words of Texas Governor Rick Perry, is "definitely not a massive phallus topped by a Christmas ornament." After the dust settled, and the dead removed from the site, the bitter memory of the Alamo was seared into the minds of Texans everywhere, like a Maverick getting branded by a Mexican ranch hand, minus the part where the cow makes a final last stand and faces the oppression of the Mexican government. The only few survivors were innocent civilians, and women. Santa Anna thought that the defeat at the Alamo would cause Texans to lose hope, or even surrender, but, not even a defeat can defeat the stubbornness and resolve of the Texan soldiers. Immediately afterwards, thousands of Texans fled their homes in an attempt to escape the wrath of Santa Anna. The Mexican general also used his history of massacres and refusal of surrender to scare Texans into stopping the war, but the memory of the Alamo kept revenge alive in their hearts. Vindication was coming, and it was to be swift and painful. On 21 April 1836, 1,360 Mexican soldiers were stationed in present-day Harris County, Texas, minding their own business, tending to tedious tasks, or on "guard duty". To their disadvantage, they were completely surrounded by the San Jacinto River, and two bayous, leaving them isolated and vulnerable to a sneak attack. General Sam Houston, seeing an opportunity to make another stealth pun, had previously planned an afternoon ambush which would leave the guards off guard and unprepared to retaliate. Amidst the grassy plain, the forces crept closer into the camp, waiting for the perfect moment to strike. In the tension surrounding the stealth mission, one soldier yelled, "Remember the Alamo! ", and the whole platoon told him to shush before attacking. Unable to counter attack, Santa Anna's soldiers weren't able to form their intricately proper row and column formation they constantly rehearsed, and were confused, scrambling to escape. At the time, the soldiers were also with their wives and children, so they didn't have much time to prepare for battle. 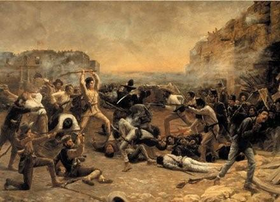 In only 18 minutes, the fierce fighting was over, and Texas emerged the clear victor, killing at least 700 Mexican soldiers, while only sustaining nine deaths and thirty injuries themselves. The coward Santa Anna was finally caught, and the revolution was ended in a Texan victory, meaning Texas could become a separate nation. Free of the oppressive chains of the government, Texans could now oppressively chain more slaves than ever before. Decades after the Battle of the Alamo, many people still remember and commemorate that fateful day. Museums have been made, and collectors have collected (often obnoxiously) Alamo memorabilia, and the site itself single-handedly saved the nearly nonexistent Texas Tourism industry; funds from the Alamo gift shop make up 8% of San Antonio's GDP. But, history is more than just money and how people have exploited it. The effects of the Battle changed the whole world as we know it, and showed the Earth Texas's fighting spirit and willingness to fight for freedom till the very end. Though some might say that the battle was more than just a simple dichotomy between good and evil, Mexico was trying to deprive Texas of its rights, and anyone who deprives you of something is obviously evil.